…President Carter’s presence at Cardozo in no way represents a university position on his views, nor does it indicate the slightest change in our steadfastly pro-Israel stance. That said, Yeshiva University both celebrates and takes seriously its obligation as a university to thrive as a free marketplace of ideas, while remaining committed to its unique mission as a proud Jewish university. [D]id anyone at YU or Cardozo read the section of Carter’s book where he sanctions terrorism against Israelis? 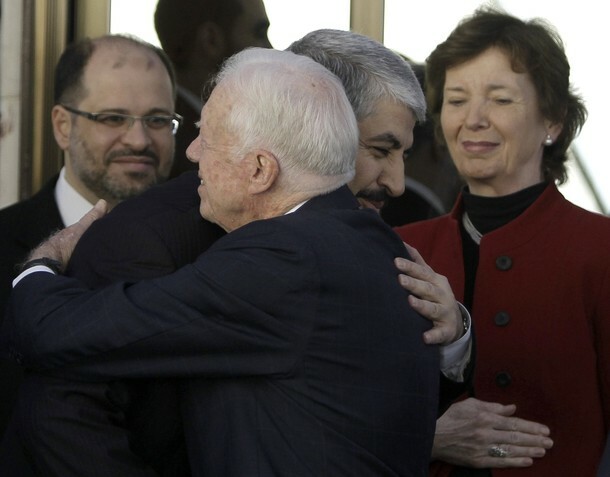 Carter is clear, and deliberate, when he writes, “It is imperative that the general Arab community and all significant Palestinian groups make it clear that they will end the suicide bombings and other acts of terrorism when international laws and the ultimate goals of the Roadmap for Peace are accepted by Israel.” Rather than decrying Arab and Islamic terrorism, Carter actually sanctions terrorism against Israelis, albeit based on Carter’s own twisted and dishonest version of reality. After the Holocaust, the world finally recognized the Jewish people’s historical and Biblical ties to the Holy Land. Israel won its first war, its War of Independence and the Jewish State was reborn. Israel has been attacked from all borders, demonized by all cultures, and fights for its survival daily. And less than seven decades later, Yeshiva University’s The Benjamin N. Cardozo Law School is presenting an award to the most anti-Israel president since Israel’s founding. Cardozo Law School of Yeshiva University: Plans to give its International Advocate for Peace Award is going to Jimmy Carter, author of Palestine: Peace Not Apartheid, on April 10. Enraged alumni have threatened to physically block Jimmy Carter from entering Yeshiva University’s Cardozo School of Law, where he is due to receive a peace award on April 10. Daniel Rubin, 62, said about a dozen former alumni are planning an act of civil disobedience to prevent Carter, a harsh critic of Israeli policies on the occupied West Bank, from picking up the International Advocate for Peace Award, given annually by Cardozo’s Journal of Conflict Resolution. Rubin said former alumni would use their knowledge of the building layout to outmaneuver any attempts to stop them. “Mr. Carter ain’t going to get anywhere,” Rubin said. “There’s no reason for a school that has any sense of Jewish integrity to have a guy like that around,” he added. And a Jewish Press followup, an interview with Alan Dershowitz as well.